A generous donation from the District of Mission on Tuesday evening will help revive the University of the Fraser Valley’s Graphic Design program. 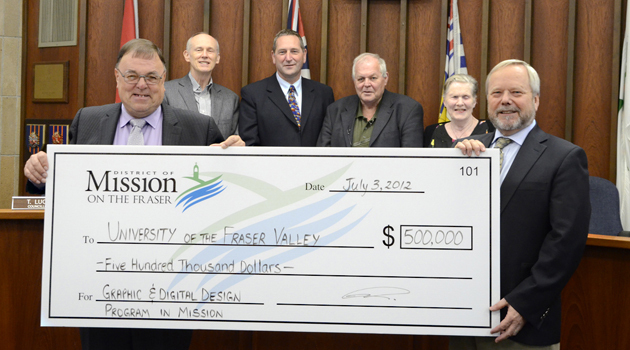 City Council presented the university with $500,000 in seed funding to establish the UFV Mission campus as the primary site for the Graphic and Digital Design diploma program. The two-year, 60-credit diploma program is being revived and updated after being dormant for nearly a decade. It was previously based at UFV’s Abbotsford campus. The new program will provide students with a foundation of design skills, from which they will go on to learn about digital design for print and web. Beginning in September, the program is already full and has a waitlist. The recent donation will help to renovate the Mission campus, and design a lab that is flexible and adaptable to the changing industry. It will also be used towards the purchase of new equipment and network setup. Students will be working with Adobe Creative Suite on a Mac system. Graphic design program graduates will be prepared to work in traditional area such as design studios, newspapers, and magazines, but will also be ready for work in web design, design for applications for the smartphone application market, the video game industry, and animation studios. Although some will find work locally or set up home-based virtual studios, Mission’s location on the West Coast Express line also opens the opportunity for graduates to commute to Vancouver and its busy design community. Heritage Park Centre has housed UFV’s Mission campus since 1996, along with a secondary school, and a community theatre. The UFV Mission campus currently offers a variety of courses in areas such as liberal arts, business, human services, criminal justice, computing, and kinesiology, as well as upgrading courses. Can anyone suggest where I might be able to find a blog or resume posting to get in touch with grads or students enrolled in this program? That’s so great. We really need to keep the arts in schools.